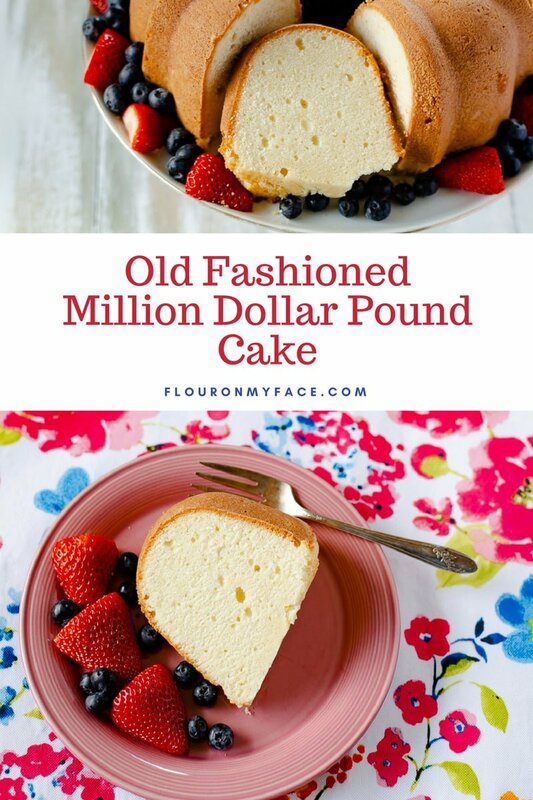 Million Dollar Pound Cake recipe makes a moist and buttery pound cake that is perfect for serving with fresh berries and cream. This Million Dollar Pound Cake is perfect for any occasion. Serve it to the family for dessert, have a piece with a cup of coffee or serve it for a special occasion. When you need a special occasion dessert make it extra special by serving each slice with a fruit topping. Summer is a great time to make a homemade pound cake recipe like this Million Dollar Pound Cake recipe. 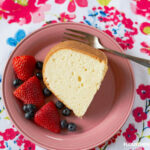 Pound cakes can be served plain or can be topped with a favorite dessert topping like fresh summer berries and cream. The Million Dollar Pound Cake tastes like a million bucks and I bet the housewives of yesteryear thought so too because the Million Dollar Pound Cake recipe has a pound of butter in it! Million Dollar Pound Cake recipe makes a rich and buttery pound cake that is delicious. I love pound cake but I don’t like to serve a plain piece of pound cake when I have guests. There are many ways you can serve a slice of Million Dollar Pound Cake that will turn a boring piece of cake into an amazing dessert recipe that can be served for any occasion. Good toppings for a pound cake will turn a piece of this buttery pound cake into a dessert recipe fit for any occasion. You can serve a recipe like the Million Dollar Pound Cake with a simple sweet drizzle of sugar glaze. Or you can make a fancier pound cake topping with fresh fruit that is in season. 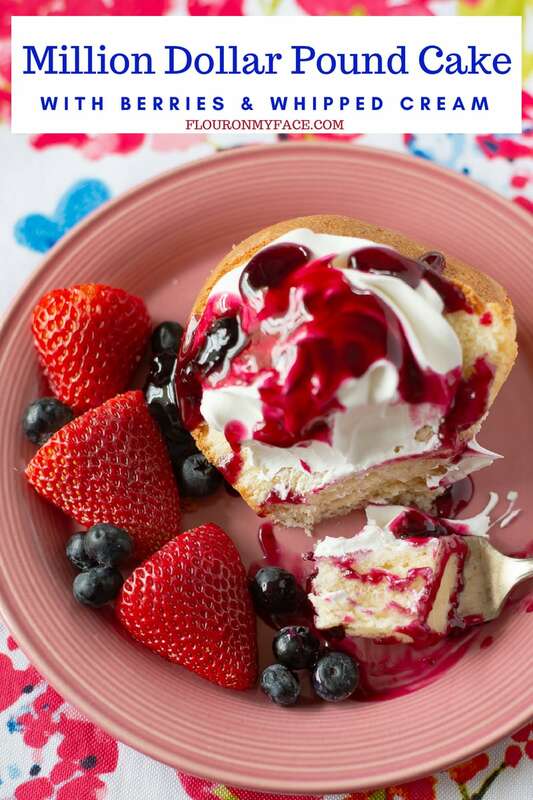 This time of year I love to serve a piece of the Million Dollar Pound Cake with fresh summer fruit like strawberries, blueberries, and whipped cream. If you have time you could also make a fresh blueberry sauce like I did and drizzled it over the fresh berries and whipped cream. Yum! A slice of Million Dollar Pound Cake with a dollop of homemade lemon curd, fresh raspberries sprinkled on top with whipped cream would be perfect served at a summer tea party. 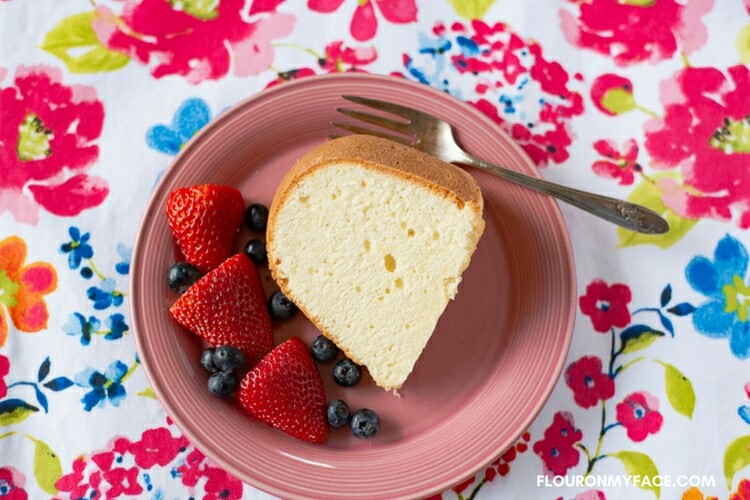 Leftover pound cake can be used to make many other dessert recipes. Leftover pound cake trifle is a great way to use up leftover pound cake. What is a tube pan? A tube pan is a round cake pan with a hollow, cone-shaped center, used for baking ring-shaped cakes. Cake recipes that call for baking in a tube pan can also be baked in a bundt pan with the exception of delicate angel food or sponge cakes. Because of the fluted or ridged decorative designs of most bundt pans, it would be very difficult to remove a delicate angel or sponge cake from a bundt pan without damaging the delicate cake. Prepare a bundt pan or tube pan by greasing it well with butter or vegetable shortening and dusting it well with flour. Preheat the oven to 300 F. degrees. In a large bowl with a hand mixer or the bowl of a stand mixer beat the butter until light and creamy. Add the sugar to the mixing bowl 1 cup at a time and beat in well. After the addition of each cup of sugar scrap the sides of the bowl. Once all the sugar is added beat for 3 minutes. Add the room temperature eggs to the mixing bowl one egg at a time, beating well after each egg is added. Once all the eggs are added beat for one minute on medium high. Begin adding the sifted flour one cup at a time. Adding a little of the milk after each cup of flour is added. Beat well after each addition of flour and milk. Once all the flour and milk are added to the bowl add the extracts and beat the batter for 3 minutes. Scoop the very thick batter into the prepared tube or bundt pan. With a plastic spatula smooth the surface of the batter. Place the filled bundt or tube pan on a cookie sheet and bake in the preheated oven for 60 minutes. After 60 minutes increase the oven temperature to 325 F. degrees and bake for an additional 30 to 40 minutes until a toothpick inserted into the center of the cake comes out clean. Remove the baked Million Dollar Pound Cake from the oven and allow to cool on a cooling rack. Once the cake is completely cool place a serving plate on top of the bundt or tube pan and flip the cake over onto the plate. If serving immediately slice the cake and serve. If not serving immediately wrap the cake well in plastic wrap and refrigerate until ready to serve. Remove the pound cake from the refrigerator an hour before serving so it can come to room temperature. Serve with fresh berries, whipped cream, and blueberry sauce if desired. Serves 16 plus depending on how thick you slice the pieces. Allow the butter to come to room temperature before beginning so when you cream the butter and sugar there will be no lumps of butter visible. When making the Million Dollar Pound Cake recipe or any other type of cake you should always use room temperature eggs. You may use 1 tablespoon of vanilla extract instead of a combination of almond extract and vanilla. Hand Mixer or Stand Mixer: You’ll need a strong mixer to beat the very thick pound cake batter properly. Bundt Pan or Tube Pan: You can make this pound cake recipe in a Bundt Pan or a Tube Pan depending on the look you’re going for. I like the Bundt Pans myself with their decorative designs for a prettier presentation. Heavy Duty Baking Sheet: Bake the filled bundt pan on top of a heavy-duty baking sheet to make moving it to and from the oven easier. Plastic Spatula: A plastic spatula makes filling the bundt pan and spreading the thick pound cake batter evenly in the pan. Wooden toothpicks: Keep a box of wooden toothpicks on hand to check to make sure the center of all cakes is cooked through. Cooling Rack: Cooling racks allow all baked goods to cool evenly and quickly. Cake Stand: Serve this awesome Million Dollar Pound Cake on a pretty cake plate or cake stand. Have You Ever Made a Million Dollar Recipe? Leave me a comment and tell me what your favorite Million Dollar recipe is. Million Dollar Fudge Recipe: Million Dollar Fudge is the best homemade fudge recipe you will ever make. It is the richest and creamiest homemade fudge recipe you’ll ever make. Vintage Million Dollar Pie recipe: This Million Dollar Pie recipe goes by a few different names. You can find similar Million Dollar Pie recipes by the name of Hawaiian Million Dollar Pie and Millionaire Pie recipe. The Million Dollar Pound Cake recipe is rich and buttery. 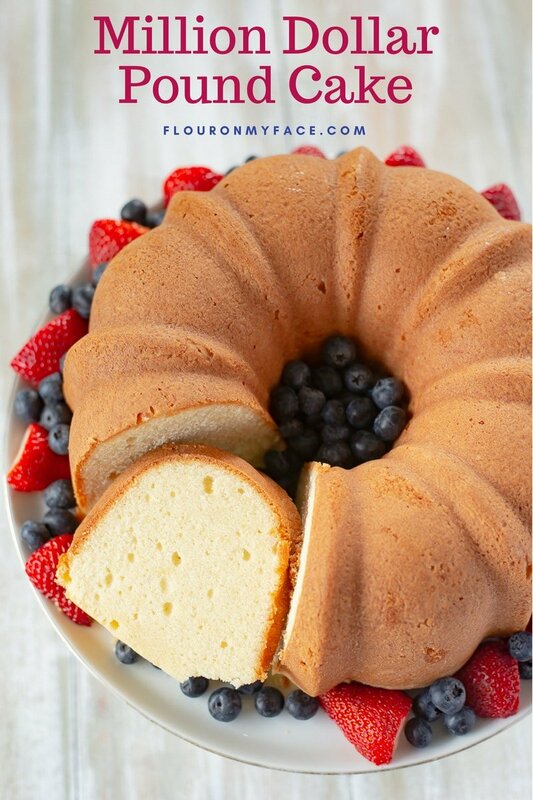 Serve a slice of this homemade pound cake with fresh summer berries like strawberries and blueberries. Then top each serving of pound cake with whipped cream. Optionally make a blueberry sauce and pour it over each serving. Add the sugar to the mixing bowl 1 cup at a time and beat in well. After each addition of sugar scrape the bowl. Once all the sugar is added beat for 3 minutes. Add the room temperature eggs to the mixing bowl one at a time, beating well after each egg is added.